Concern has been expressed in the electrical community regarding the aging of electrical systems in residential occupancies, possibly resulting in fires. A question not yet fully answered is: “Why is there a residential electrical fire problem in the United States, even though we have such a good code?” Among the potential answers may be that electrical components, like any product, age over time. Coupled with this, residential electrical systems are seldom inspected after original installation and original installation quality may be a factor. This project hopes to address this issue in two ways. First, a comprehensive survey of the condition of representative samples of residential electrical components installed in different eras and locations will be undertaken to determine what characteristics may influence electrical performance. Second, development and pilot testing of a post fire investigation checklist will assist in documenting the relationship between system age or installed condition and impact on fire incidence. This project will provide critical information to code writers—especially for NFPA 73 and the NEC® —as well as AHJs, electrical equipment manufacturers, installers, property owners, and insurers. Photo 1. Harvesting aged electrical components from houses scheduled for demolition is “dirty, nasty work,” but it provides the most accurate picture of real-world situations. The overall goal of the project is to characterize the condition of various age groups of residential electrical systems, by surveying a representative sample of actual installed systems, and to document how aging and installation may relate to residential electrical fire experience. The survey: A comprehensive survey of actual installed residential electrical system components from the service point to the outlet will be undertaken over a period of two years. Samples will be taken from residences constructed in this century, in age groups ranging from 1920 and earlier to 1970 and later. Their condition will be documented and tested both on site and in a laboratory test program. Alterations and the date of alteration also will be documented. The fire investigation: With the assistance of fire and electrical inspectors, an investigation tool or checklist will be developed which documents actual or estimated age of components/system believed to be involved at a residential fire’s point of origin. This tool will be tested through use at approximately 100 fire incidences over the project time frame. The project has been separated into two phases, the first being the plan development and the second being the implementation of that plan. The project is guided by a Technical Advisory Committee (TAC) consisting of experts from the manufacturing, inspection and insurance industries. It is funded by an industry consortium. Phase I of this project, completed in September 2004, involved development of the electrical component sampling and analysis procedures. 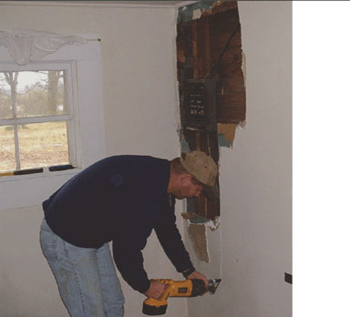 The TAC determined that the most productive way to obtain electrical components for sampling would be to harvest them from residences that were being demolished or undergoing renovations. This would allow access as well as removal of the components. The TAC developed a preliminary list of components to be removed from the selected residences and agreed that several “”pilot programs”” should be conducted to further determine the components to be removed, how much to remove and what would be of value during the analysis. A total of three pilot programs were conducted in 2003 and 2004. Components were harvested and sent to Underwriters Laboratories Inc. for analysis. Upon completion of the three pilot projects, the TAC developed harvesting procedures for components (listed below) that could best be analyzed and would provide the most data regarding the effects of aging. 1. Recover 3 ft of the utility service drop and the service-entrance cable. 2. Recover service-entrance panel and 3 ft of each branch-circuit wiring attached to the panel. (Note: do not operate any circuit breakers). 3. Recover receptacles from kitchen, bathrooms, laundry, outdoors, those dedicated to major appliances, and any that may look or be suspect. Recovery should encompass the outlet box (without disturbing any wiring) and 3 ft of wire/pipe on each side. 4. Recover kitchen luminaires, outdoor luminaires and any luminaires that extend into attic space. For luminaires, also recover lamps. Recovery should include the outlet box and 3 ft of wiring. 5. Recover some wiring system and components from the attic and crawl space areas. 6. Recover a few junction boxes, especially where splices may be encountered, including 3 ft of wire from each box. 7. Devices such as meter socket, wall switches, fans, etc., should be recovered if they show evidence of problems. 8. Any cord sets should be recovered and labeled as to where they were found. The goal of the project is to obtain component samples from approximately 100 residences located throughout the United States. A representative sampling of locations encompassing the majority of the environmental conditions found throughout the country were identified. These areas are the Southeast (Florida), Northeast (New Jersey) Southwest (Phoenix) West Coast (California) Northwest (Oregon) and Minnesota/Wisconsin. It was decided that in order to obtain samples from each of these areas, volunteers or “”Champions”” would be identified and asked to participate in the program. These Champions, who typically are electrical inspectors in the areas of interest, were contacted and all very enthusiastically agreed to participate in the project. Phase II of this project will implement the harvesting procedures developed as a result of Phase I, with the goal of harvesting and analyzing components from a minimum of 100 residences from the different geographic areas and age groups identified, over the next two years. Phase II will also see the development of an enhanced fire investigation program to better understand the relationship of electrical component aging and real fire experience. The project will select and collaborate with an AHJ (local government or federal agency), and with them, develop and test a questionnaire that focuses on recording the estimated age and installed condition of components/systems believed to be involved at an electrical fire’s point of origin. The project is scheduled for completion in 2006. 1. A comprehensive residence sampling plan has been developed which defines the number, age and location of residences determined to be representative of conditions around the country. 2. A practical set of component harvesting procedures has been developed and tested in three locations. 3. A testing and analysis program has been developed which includes both on-site and laboratory testing designed to determine the factors that influence the performance of aged electrical systems. 4. An implementation plan for Phase II which includes the confirmed participation of a series of Champions across the country is in place. With the implementation of Phase II, the project will develop valuable information to code writers—especially for NFPA 73 and the NEC—and to electrical, fire and building officials, electrical equipment manufacturers, electrical workers, property owners, and insurers, regarding the effects of aging on residential electrical systems as it relates to electrical fires. The Foundation is a charitable organization formed by NFPA in 1982 to address the growing need for independent research to assist fire safety codes and standards. Three key research related activities take place at the Foundation. The Foundation is co-located with NFPA in Quincy, MA, and meets regularly with NFPA Technical Committees across the country to determine the technical issues they are facing and look for ways to assist with research solutions. Kathleen Almand is the Vice President, Research, at the National Fire Protection Association (NFPA). She is the former executive director of the Fire Protection Research Foundation from 2004 to 2014. She has a MSc in Civil Engineering from the University of Ottawa.